Located in Jupiter, the northern-most city of populous Palm Beach County, the Loxahatchee River is South Florida’s best kayaking river and makes a great place for a variety of canoe and paddling outings. The “wild and scenic” part is the 7.6 mile stretch from Riverbend Park in Jupiter downstream to Jonathan Dickinson State Park. The eggs of the apple snail looked like bubblegum stuck to the cypress knees along the Loxahatchee River on a March trip. You can kayak that whole stretch and have the outfitter return you to your car or you can take two smaller round trips. As a result, the Loxahatchee River offers alternatives, ranging from kid-friendly one- or two-hour kayak or canoe trips to an all-day adventure. In each case, you can bring or rent canoes or kayaks easily and inexpensively. Turtles along the Loxahatchee River, which means river of turtles. 1. The classic Loxahatchee River kayak trip. When folks talk about kayaking or canoeing the Loxahatchee River, they probably mean the eight-mile trip from Riverbend Park, 9060 W. Indiantown Rd., Jupiter, to Jonathan Dickenson State Park. On this five- to six-hour trip, you kayak under a canopy of cypress trees with a profusions of ferns, airplants and cypress knees lining the sometimes narrow, twisty route. Birds, turtles and alligators are common. The kayak trail includes paddling over two small dams that give a tiny whitewater thrill. A few miles downstream, boaters may have to pull the kayak over fallen logs. Kayakers pass by Trapper Nelson’s camp, an interesting stop to explore and enjoy a picnic, and then the river changes character and broadens into a mangrove estuary. Note: New outfitters have taken over the operation at Riverbend Park — Jupiter Outdoor Center, which has operated a large operation in eastern Jupiter on the Loxahatchee. The full-day trip to Jonathan Dickinson is only offered on an ad hoc basis at the moment (as of December 2018.) You need to arrange it in advance by calling 561-746-7053. The outfitter plans to establish a regular livery service in 2019. 2. Just the good part through the cypress forest. This is a good alternative for visitors until a regular pickup service is established at Jonathan Dickinson State Park. The outfitters called this the Cypress Canopy trip. This trip takes in the best scenery on the Loxahatchee River, from Riverbend Park to Masten Dam in two hours roundtrip. For this outing, you begin at Riverbend Park, kayak as far as you want, and then paddle back, upstream, to where you started. Although the Loxahatchee River has a bit of a current, it is not that difficult to kayak back. The outfitters recommend that for each hour downstream, you allow one hour and 15 minutes upstream. We found the scenery so stunning, we were happy to see it again more slowly on the upstream leg. Riverbend Park has a separate launch area for people who bring their own canoes and kayaks. 3. Canoe upstream at Jonathon Dickinson State Park. This kayak or canoe trip allows you to experience a different Loxahatchee River. Here, the river is broad and tidal. Paddlers often see wading birds and occasionally manatees, ospreys and bald eagles. You can put your own canoe or kayak in or rent. More information, call�(561) 746-1466 or here. 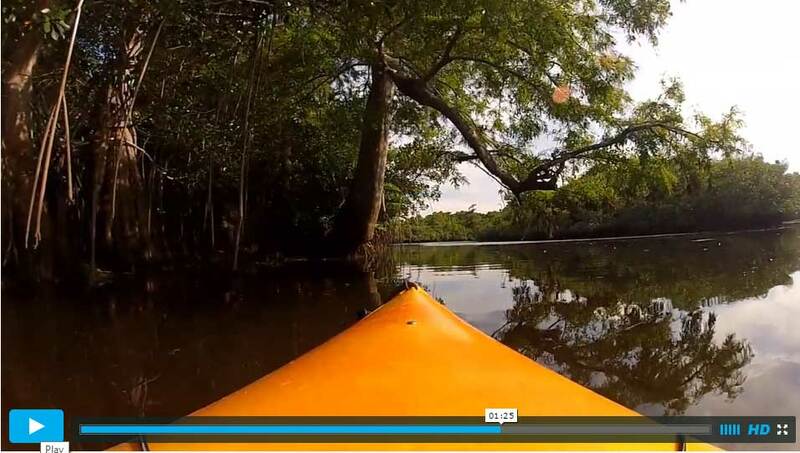 This video by Marcelo Pavao shows peaceful paddling in the eastern portion of the Loxahatchee, where he was lucky enough to see manatees. 4. Kayak outings beginning near Jupiter Inlet. The Jupiter Outdoor Center,1000 A1A, Jupiter, rents kayaks and standup paddleboards from their dock as well as operating various area tours. From the outdoor center, you can paddle around mangrove islands and explore Jupiter Inlet. More information: Jupiter Outdoor Center, 561-747-0063. Note: It is easy to be confused by the various places called Loxahatchee. About 45 minutes south, you will find the Loxahatchee National Wildlife Refuge in Boynton Beach, an Everglades experience with a nice kayaking trail through a sawgrass marsh. It has no connection to the Loxahatchee River, however. Kayak and canoe rentals in the park: Call (561) 746-1466�. Jupiter Outdoor Center for kayak and canoe rentals and livery from Riverbend Park. Jupiter Outdoor Center for guided tours and kayak rentals near the Jupiter Inlet. Riverbend Park, where the kayaking trip begins, is also a great place to bicycle and picnic. You can rent bikes from Jupiter Outdoor Center too. Jonathan Dickinson State Park is a big park, with long hiking trails, good bike trails for both road bikes and mountain bikes and some very cool history. The little cabins there are a great place to stay; there are also good campgrounds. Here’s a comprehensive story on Jonathan Dickinson State Park. Twenty minutes east of Riverbend Park is�Blowing Rocks Preserve, an outstanding and unique beach very nearby. Next door to Blowing Rocks is a�good places for snorkeling from shore. On your way to Blowing Rocks, you’ll pass the�historic 1860 Jupiter lighthouse, which is one of the few lighthouses you can climb. The waterfront museum in the newly restored WWII building offers indoor Florida history exhibits, outdoor exhibits and the Tindall Pioneer Homestead. It�™s $9 for adults, $5 children ages 6 to 18, ages 5 and under free. Guanabanas�is 15 minutes from the park and it�™s a completely outdoor waterfront restaurant with a huge banyan tree, chickee huts, waterfalls and lush landscaping.� The place would be worth visiting just for its appearance, but its fresh, locally sourced seafood is outstanding as well. Square Grouper Tiki Bar, 111 Love St., Jupiter: This is such a classic beach bar that it was used as the locale for the “It�™s Five O�™Clock Somewhere” music video featuring country music artist Alan Jackson and Jimmy Buffett. It�™s right on the sandy beach of the Loxahatchee River overlooking the 1860 lighthouse and the inlet. It�™s very popular; best time to visit is in the afternoon.�Here�™s what Yelpers say�and here’s�the “Five O�™Clock Somewhere video. Twenty minutes south Jonathan Dickinson State Park is another grem: John D. MacArthur Beach State Park, which has a spectacular beach and offers a nice kayak paddle to Munyon Island. Drive north a half hour and you reach�St. Lucie Inlet Preserve State Park, a state park reachable only boat with a beach you’re likely to have to yourself. I have canoed in many waters with alligators and once passed a 15-foot crocodile in Everglades National Park! “Don’t fall out” is a good start! Basically, don’t get closer than you need to and don’t bother them. Usually, gators act oblivious to paddlers or, if they move at all, they go in the opposite direction. i never paddled where there are gators. what kind of issues does that create (seriously), other than “don’t fall out of the kayak”?